Mason Tyson’s life got off to a rough start. But this is a story about a kid who beat the odds and has come back healthier than ever. If you are looking for some serious inspiration (and some lessons about health) then you’ve got to check this out. Mason was just about to celebrate his fourth birthday when his parents, Scott and Nicole, were forced to rush him to the emergency room after they felt a lump in his abdomen. Doctors performed surgery to remove the tumor, but tests and scans indicated that tumorous cells remained in his lymph nodes. Chemotherapy remained an option, but after weighing the pros and cons, the family believed the side effects were too risky. Ultimately, however, the health crisis prompted the entire family to look at its diet and lifestyle. As Scott explained, “We realized, first off, we’re living horribly as far as what we’re putting in our body, food-wise.” The Tysons decided to go with a largely organic and plant-based diet. Yes, they sometimes ate meat, but it became an occasional side (instead of the main entree). The switch to a mostly plant-based diet wasn’t always easy. As Mason recalls, “I remember very long nights where I was reluctant to drink juices or eat my vegetables.” But the health benefits would soon become apparent. Mason’s cancer eventually became non-progressive and he is now deemed by his doctors to be cancer-free. There is no way to say for sure if Mason’s plant-based diet was decisive, but the family credits both the surgery and his clean eating as being instrumental in his remission. The health crisis has prompted the family to give back in a big way. In 2009, the Tyson’s started their own 180-Degree Farm, a non-profit that helps provide organic produce to families facing cancer or other serious diseases. Mason, now 15, appears to be living proof that eating a plant-based and pesticide-free diet is conducive to good health. 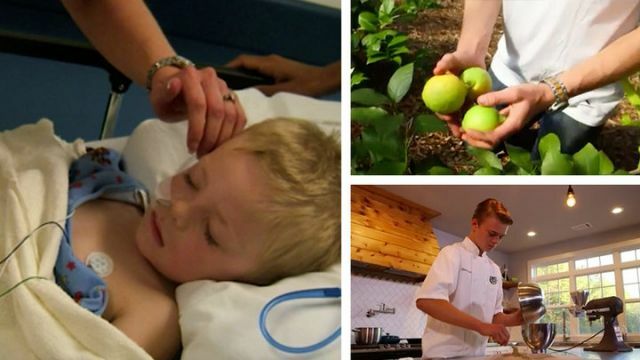 The young man not only helps deliver organic vegetables to the children’s cancer center where he was once treated, but he is also studying to be a chef. That message is increasingly important. A number of recent scientific studies and reports have linked pesticide exposure to childhood cancer. As Dr. Chensheng Lu, an associate professor at Harvard explains, “Childhood cancers are increasing year by year in this country, (and) there is disagreement about what is contributing to that, but pesticides have always been on the radar.” In fact, pesticide exposures have been linked to a 47 increased risk for childhood leukemias. Conversely, numerous studies suggest that a plant-based diet can help prevent cancer, which is why the American Institute for Cancer Research recommends fruits, vegetables and whole foods as one of the most effective ways to lower one’s risk for the disease. Hey Buddy!, I found this information for you: "This 4-Year-Old Beat A Rare Form Of Cancer Without Chemo. Here’s How". Here is the website link: https://www.thealternativedaily.com/4-year-old-beats-cancer-with-surgery-and-plant-based-diet. Thank you.